Pilots at US Airways have voted in favor of giving $300 million in annual wage and benefit concessions to the struggling airline, becoming the first major labor group to accept permanent cuts, the union representing pilots said yesterday. US Airways made its second bankruptcy protection filing in two years on Sept. 12. Last week, a Federal Bankruptcy Court in Alexandria, Va., granted the airline's bid for emergency pay cuts of 21 percent, and other benefit reductions, for its union workers. Without the cuts, US Airways said, it could cease operating by mid-February. Pilots at other airlines are facing similar efforts to reduce pay and benefits. Delta Air Lines, which is trying to avoid joining US Airways in reorganization, is pushing its pilots for $1 billion in wage and benefit cuts. United Airlines, which has been in bankruptcy protection since December 2002, said last week that it would soon outline plans to nullify its labor contracts and replace them with less-expensive pacts. Last year, United's parent, the UAL Corporation, obtained concessions worth $2.5 billion a year from its unions. 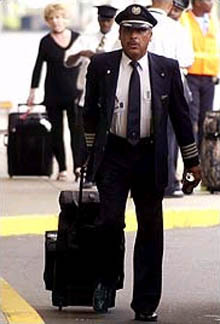 US Airways pilots voted 58 percent in favor of the contract, a wider margin than some analysts had expected. The vote means members of the Air Line Pilots Association, which represents 3,200 active and laid-off US Airways pilots, are exempt from the emergency cuts. Pilots at the struggling US Airways voted in favor of giving $300 million in annual wage and benefit concessions to the airlline, the union said. Instead, their pay will be cut 18 percent a year, a total of $1.8 billion in savings for the airline through 2010. The new contract will also sharply reduce US Airways' contribution to the pilots' retirement plan, eliminate health care benefits for pilots after they retire, and increase the number of hours that pilots must fly each month. 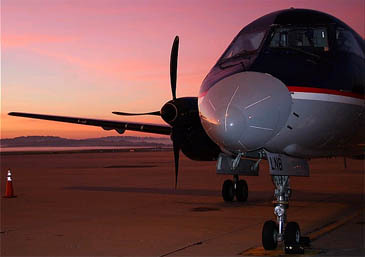 Approval came despite the rejection of the contract by pilots in Pittsburgh and Philadelphia, two of US Airways' three hubs, the other being Charlotte, N.C. In both Pittsburgh and Philadelphia, 52 percent of the pilots voted against the contract. 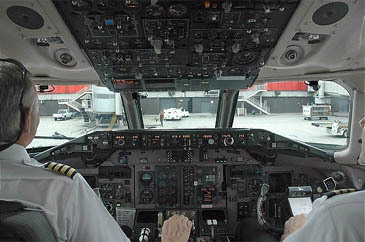 Leaders of those pilots had blocked an effort in September to send an earlier proposal to a vote. They were especially angered by the reduction in retirement benefits, which had already been cut sharply in the airline's first bankruptcy filing. In recent days, the Pittsburgh and Philadelphia pilot leaders stepped up efforts against the tentative contract, arguing that pilots could get a better deal if negotiations resumed. But other officials of the union disagreed. They pointed out that US Airways had held back on starting the emergency pay cuts while the pilots voted. Had the contract been rejected, the emergency cuts would have been applied immediately, retroactive to Oct. 15. And, these leaders maintained, it was likely that any subsequent contract would be worse than the one presented to pilots for a vote. Pilots based in New York, Boston, Washington and Charlotte favored the contract, the union said, enough to win its approval. "While the burden that the US Airways pilots have agreed to shoulder is immense, this vote signifies that our pilots acknowledge the pain and sacrifice that is required to address the reality of our situation," said Bill Pollock, a US Airways captain who is chairman of the union's master executive council. In a statement, the airline said: "Our pilots have demonstrated their leadership in working with us as we transform US Airways into a successful and competitive airline. We appreciate their thoughtful and careful consideration of the very difficult issues that will soon confront virtually every one of our legacy competitors as well." US Airways executives have repeatedly said they hope to reach agreements with other unions representing flight attendants, mechanics and reservations agents. Analysts said the approval by the pilots could lead to movement in contract negotiations. But the urgency of getting new contracts was diminished by the judge's decision to impose emergency cuts for the next four months, said Robert W. Mann Jr., an industry consultant in Port Washington, N.Y.
"What's the company's incentive to deal?" Mr. Mann said. If the airline faced the prospect of getting less from unions than the emergency cuts generated, "what might be better for employees would be worse for the company." The above article is from The New York Times.